Manila's most fashionable come together to party and check out Oxygen's latest interpretation of street chic. To launch their latest collection, fashion brand Oxygen treated fashionistas to a night of style and music at Whitespace. Guests enjoyed the turntable stylings of DJs Chie Castaneda and Gigee (AKA Gian Romano, who is also a designer and stylist) and were wowed by the super hyperactive performance of Us-2 Evil-0, fronted by director Quark Henares and fashion designer Mich Dulce. Oxygen premiered a photo and video exhibit featuring Doc Marlon Pecjo, Divine Lee, Quark Henares, Revolution, Pam Pastor, Kai Magsanoc, the guys of Boys Night Out, P&P Tattoo, and makeup artist Jigs Mayuga. Spotted at the party were models Helena Belmonte and Jasmine Maierhofer, and DJ Jon Herrera, among others. Guests were taken aback when models suddenly strutted into the room in their underwear! They grabbed clothes off the racks in front of them, dressed up quickly, and then worked a small platform to show off Oxygen's latest line of stylish, street chic clothes. Oxygen's all about the light fabrics, loose silhouettes, and understated glam, and you can take their new line from day to night with ease. 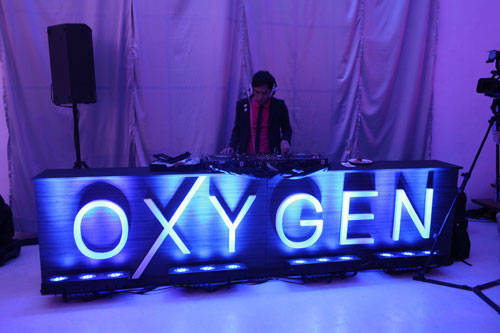 Click through to our Gallery to check out photos from the party and the show, and see more of the new collection at http://www.oxygentm.com.